You just need 3 steps to make your teeth cleaner and brighter. 1) Filling water into the tank. 2) Then install the tips. 3) Finally press ‘on’ button. It is suggested that point the tips along the gum to floss. 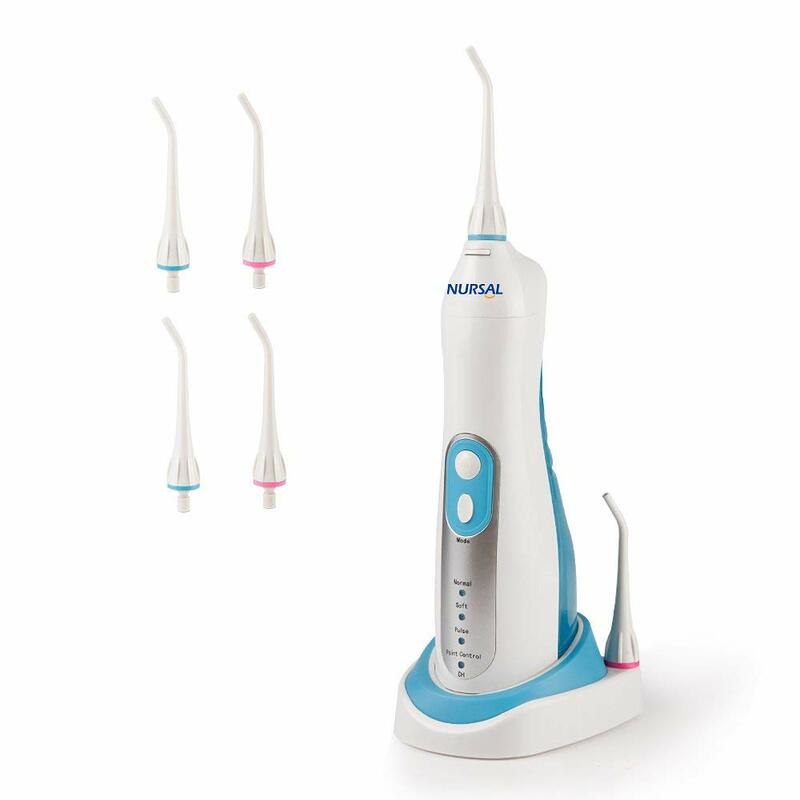 By selecting Nursal portable oral irrigator you are now on your way to a healthier gum and a brighter smile! 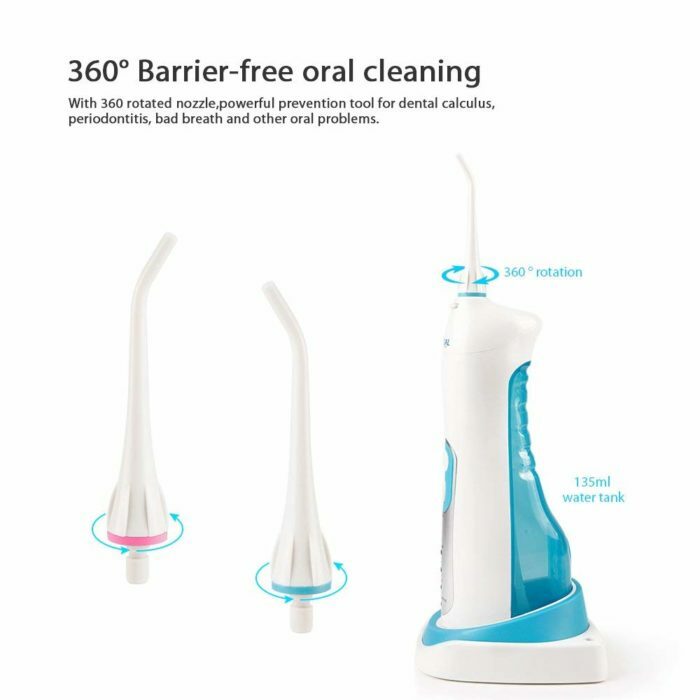 With a clinically proven combination of water pressure and pulsations, the product removes harmful bacteria deep between teeth and below the gum line – where brushing alone will not reach. Normal: For normal cleaning of the mouth. Soft: Gentle cleansing for sensitive gums. Pulse: for cleaning and massage of the gums. 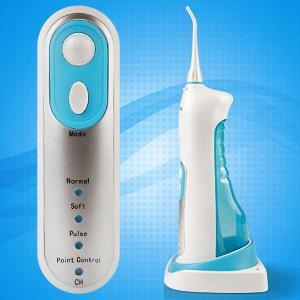 Point Control: Precision cleaning for the teeth. Want to have charming smile? Get Nursal oral irrigator and use it at home every day. Then it will come true. Need to keep teeth beautiful during trip? 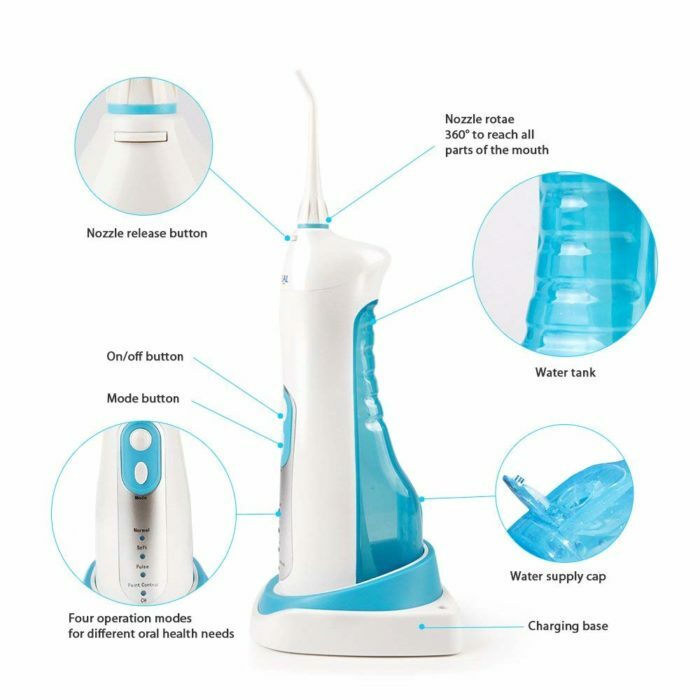 This NURSAL oral irrigator is portable. Use this unit, enjoying your trip really with a charming smile. -Reduce the formation of calculus. Congratulations! 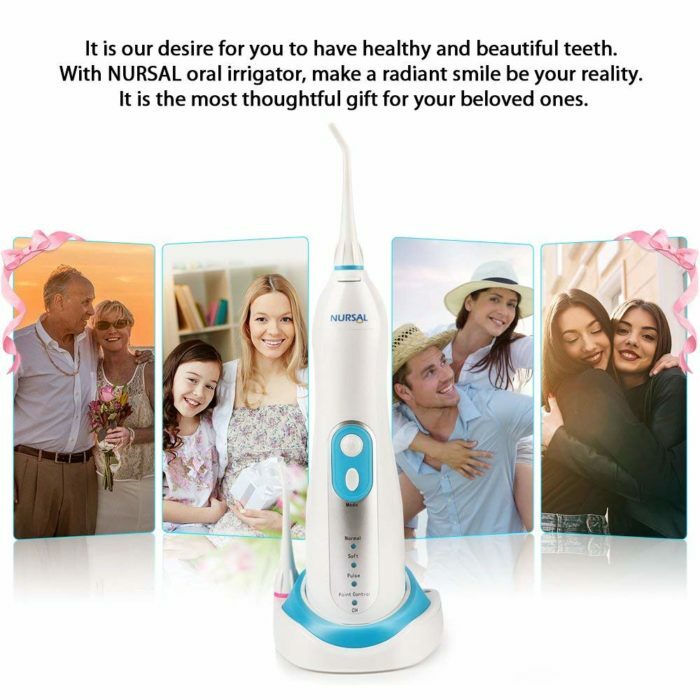 By selecting NURSAL portable oral irrigator you are now on your way to a healthier gum and a brighter smile! 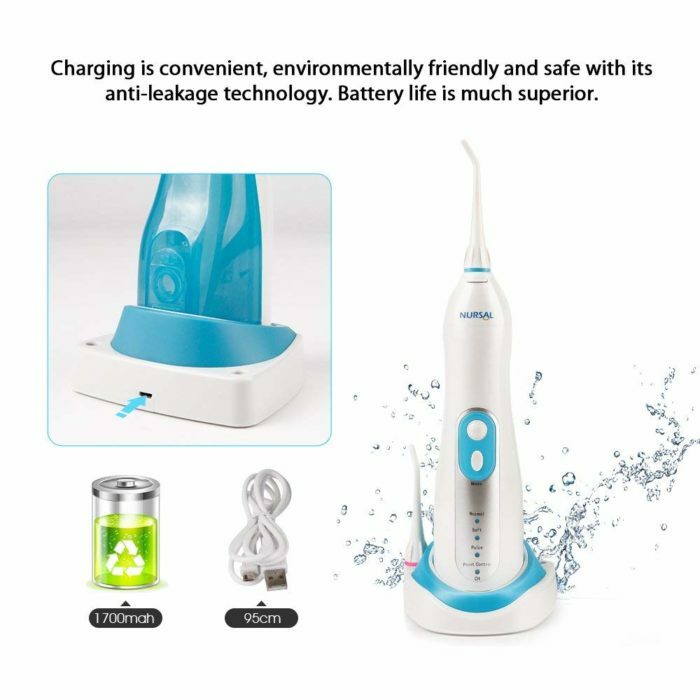 With a clinically proven combination of water pressure and pulsations, the product removes harmful bacteria deep between teeth and below the gum line – where brushing alone will not reach. Thank you for choosing NURSAL portable water flosser. 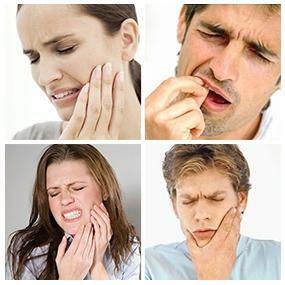 Traditional Oral Care and brushing cannot easily reach hidden food debris and harmful bacteria. Flossing is limited in accessing below the gum line. 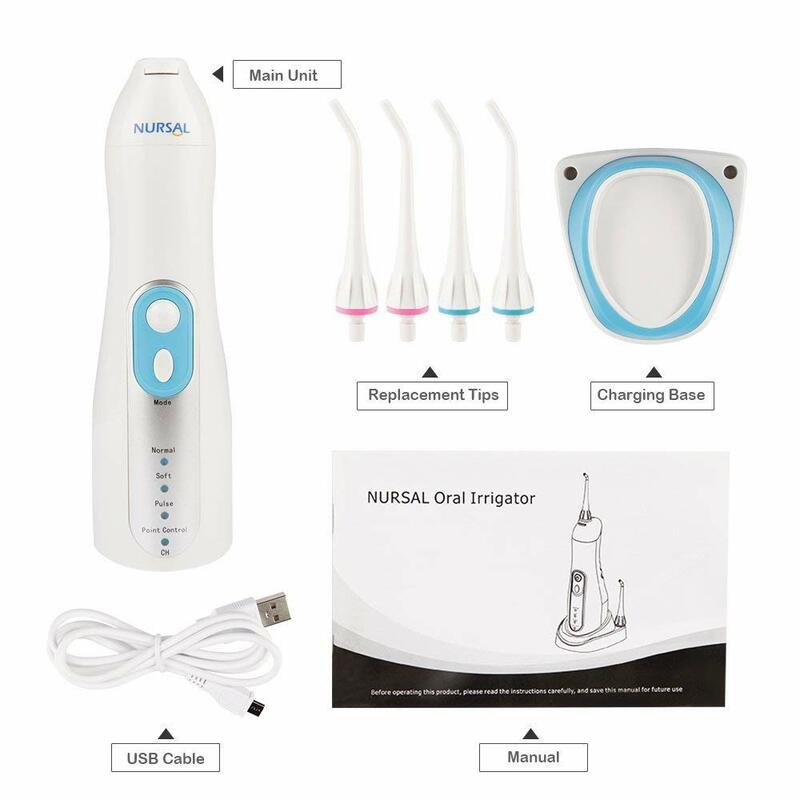 The NURSAL Oral Irrigator removes trapped food debris and harmful bacteria. 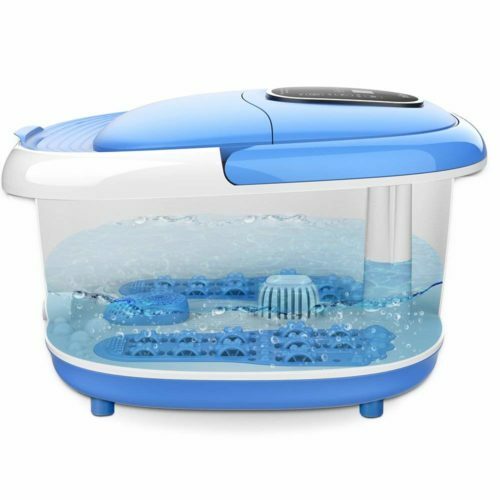 Question: How much water does the tank hold? Question: Does it come with a charger plug or only a usb cable? my order only come with a usb cable, is that normal? Answer: I only had a USB cable as well. Question: How many picks come with unit? Answer: 2 picks come with unit. Great price. Have been very satisfied with the product. Product not great, but great customer service! Well designed and realy does the trick. Strong pulsing action. It’s nice but the only complaint I have is where you put the water in it leaks it’s not tight enough. Loved this – the first one stopped working after 2 weeks and the company promptly sent another one. The 2nd one lasted until the end of the warranty period and died…..so sad. Really liked using one August 2018: This is an update to my previous review. 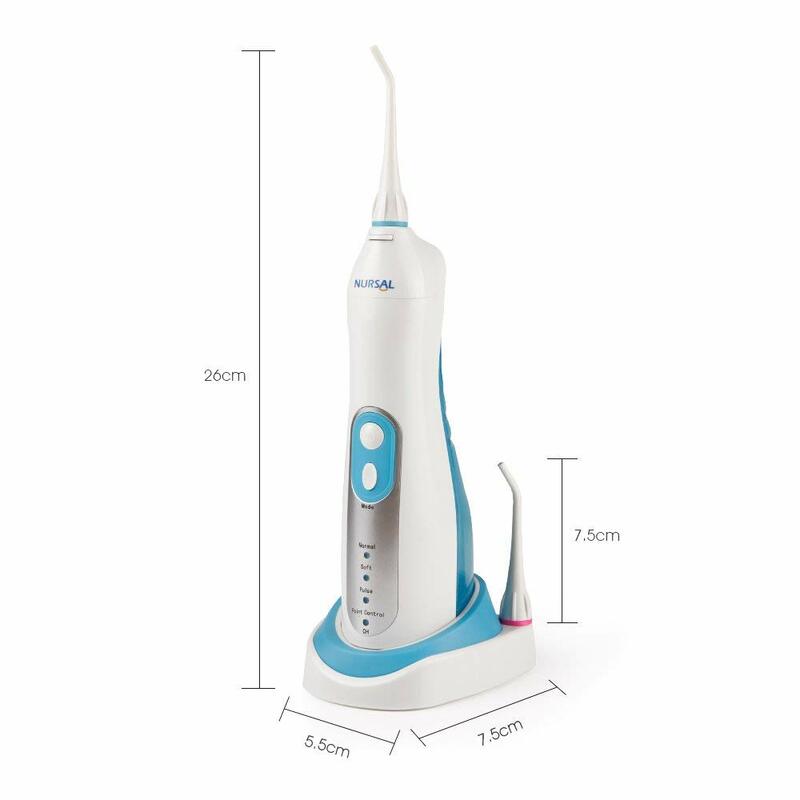 I was contacted by this company to receive a new model of this flosser free of charge with fast shipping. I highly commend customer service here. In this day and age, consumers want companies to “just make it right.” And they did just that. The new product is sturdy and working great. So happy to have it in my life again! Love it. Very convenient and easy to handle. I Love this! High pressure & works Great!!! Got this for my daughter. She recently got braces and she hasn’t complained. I love my Nursal dental floss. I can’t believe the food that comes out even after flossing. My dentist wants me to replace a crown as food get into one of the pockets and causes me pain. Happy to say that since I’ve been using the water dental flosser, I have not experienced any more pain. I also love that it’s portable and uses very little space. I couldn’t be happier with this purchase. Almost two years after this purchase, I accidentally threw away the charger base. They agreed to send me a whole new unit. A great company to do service with. 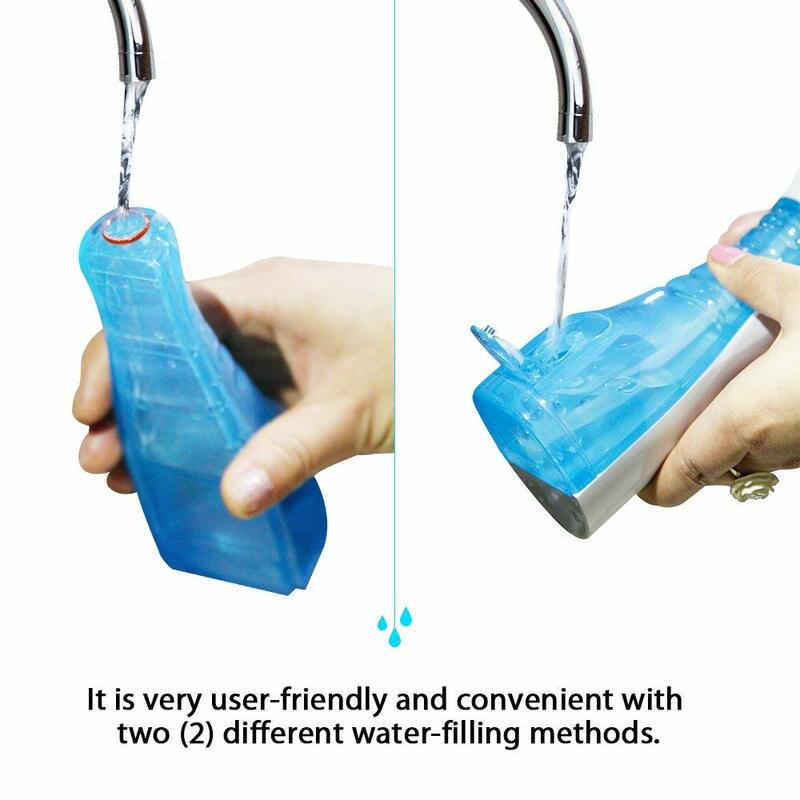 The product is great. Works well with no issues at time of this comment. My teeth felt very clean after using. I would recommend. The price was excellent as well. However, the company offered two free additional Jet tips nozzels when registering, which I did. I received an email from the company stating that they were out and would I accept 5 Euros instead. I sent a email back stating I lived in the US, basically “no”. I have yet to here back from Nursal as of 1/29/2018. UPDATE: The company recently contacted me by email and gave me a coupon code to order two nozzles at no cost thru Amazon. Outstanding service. Very nice. Works great . We both Love it.. It works well and has several settings for intensity of spray. What I don’t like is that I can’t get inside of the reservoir to clean the sprayer. 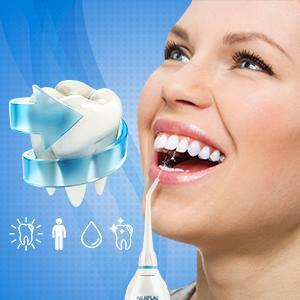 Also, it advertises as a dental flosser with 4 free nozzles. Mine only came with 2 nozzles. Nice unit. Charges with no issues, cannot wait to use this on a day to day basis. When I cleaned my teeth last time, my hygienist suggested me to buy a dental flosser for cleaning food residue after eating. She had some recommendations, and I bought this one. It has four working mode, normal, soft, pulse, and point control. It is very easy to use, and you just need to push one button to select the mode. I like the pulse mode, and it feels very comfortable to clean the teeth with the water flosser. It comes with a stand base. You can charge it with the USB port. It works very well until now and I am very happy with it. 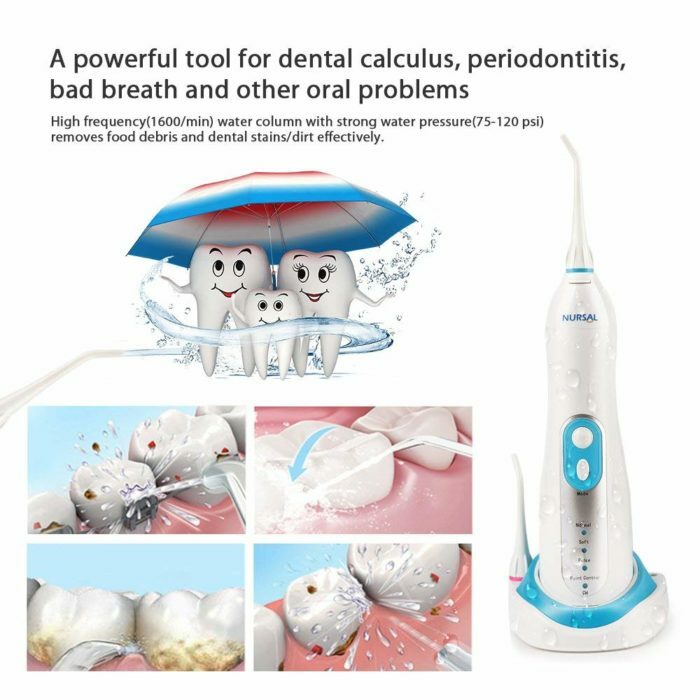 first time buy this kind of flosse, i use it 3 times a week and right know i love it so much, like i can get dental cleaning everyweek. Worked great for 4 months. Now it won’t charge. Wouldn’t buy it again. First water flosser I have ever used and I have to say I prefer this over string floss. 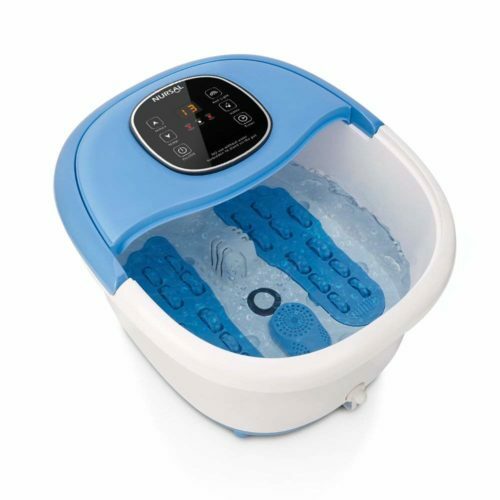 It has four settings (normal, soft, pulse, and a precision one) plus very easy to use.